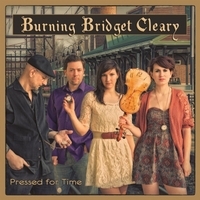 I put on the uniquely named Burning Bridgette Cleary album, Pressed For Time, and I think, these kids just got off the boat from the Old Sod and are trying to make it in America. Well, this energetic and talented quartet is from Philadelphia and recently returned from playing in Ireland. The irony of it all is not lost on me. The band offers tight harmonies and lively performances of traditional and folk Irish music, courtesy of fiddlers / singers Rose Baldino and Deirdre Lockman. Bass and percussion balance the music with the talents of Lou Baldino on bass and guitar and Peter Trezzi on drums. You will be entertained by their electrically charged jigs and reels and their warm ballads. Of course, I had to know the history of the band’s name and it is rather peculiar. I returned to 1895, where Bridgette Cleary, the wife of a cooper, was just judged a bit different from the other villagers and that difference is all it took to brand her a witch or maybe even worse, in complicity with the faeries. The insanity of her husband and the other villagers caused her strange disappearance. It was later that her mutilated body was discovered and the trial of the century ensued, that of the last witch of Ireland... perhaps. I love things and people that are different and that difference should be and is celebrated on this high-spirited recording. Pressed for Time / Bonnie Mulligan is a full of brio instrumental. The title tune becomes the beginning of a musical chronology of historical happenstance. The band has cobbled together a rollicking set on this one. Pressed for Time opens with strong guitar strumming winding up for the fiddler's grand performance. It is an industriously contrived reel and Bonnie Mulligan celebrates the creativity of fiddler Peter Ostroushko. I would buy the album on this song alone. Ashokan Farewell is one of the few slow tunes on the recording. Written by Jay Ungar no less than thirty years ago, it is a sweet waltz that has been used on stage and screen as a "bid thee farewell" lament. I actually remember this song from a British TV series called Copper and I thought how sad, but beautiful when I heard it. To me it had a distinctive Appalachian tone to it. Oh My Little Darling / Fire on the Mountain is a country tune, plain and simple. It does not matter what country you're playing it in, the whining fiddles, steel guitar, and lyrics decree a square dance, a brightly lit barn, and a lot of straw. With raging fiddles, it is a fun song guaranteed to get your toes tapping, or better yet, grabbing a partner and twirling around the dance floor. At first, I thought it might be out of place, but when I considered the energy level of these music makers, it felt right at home. Again, Burning Bridgette Cleary takes on the anthem of an infamous crime in the tune The Ballad of Tim Evans. This song packs a lot of driving music into a short period, but keeps your attention with solid harmonies. The crime, the murder of the wife and daughter of Tim Evans, spans several decades. Oh, Tim was dropped through the trapdoor back in the 50's, but the question of his culpability remains as controversial today as it did back in the day. No one likes the idea of leaving home, especially if you are the sort of people connecting to the land and its history, but that is what the song Sitting in the Stern of a Boat is about. Penned by the Reverend William McLeod, in the early 1800's as he leaves his beloved Isle of Skye for a new parish position in Argyll, this slow Scottish air fairly weeps with regret and trepidation. Much of Ireland’s traditional music is based on the stories of the diaspora of the Irish in the early 20th century. Stor Mo Chroi / Eddie Kelly's is such a tale. It is a song of lover's separated by Atlantic waters and the promise of fortune in the Americas. The vocals are sweet on this ballad, but the music is quite strong, the band sounding much larger than a quartet. I would imagine that coming away from a live performance of Burning Brigitte Cleary would leave me drained, but in high spirits. Sometimes the music reminded me of my Meme’s (French Canadian grandmother's) Quebecois rondos. Even if I were sitting completely still, listening to this music would make my heart clap with these tunes. It is addictive and exciting. Highly recommended.